After yesterday's negativity the team decided to start the day with a long healthy breakfast and a trip to some art galleries. We were not necessarily looking to get inspired by the galleries, but looking for a change of scenery and routine. Visiting the different galleries gave us a sense of different cultures, colours and shapes. These all enriched our minds and started a deep new thinking process. After returning to the atelier Marina and Lina started discussing design ideas. As always the question we ask everyday came up - what would we like to design today? This is a straightforward question, but today it got the team thinking about all the designs they have created up until now. Reminiscing about the project and designs, brought up funny memories. One in particular inspired today and never fails to brighten the design team’s mood. After a long day, Lina was helping Marina to sew a piece. Lina was pinning the sleeves on the blouse, but something was wrong, it did not fit? This was odd as the other sleeve fit the design perfectly, so what had gone wrong? After a long second had passed Marina pointed out that Lina was pinning the sleeve to the neckline. This made the design team crack up in hysterics, it was such an obvious but simply made mistake! This story massively inspired the day, the designs are always nearly perfect but mistakes are made. “Almost perfect” was the key inspiration for today, it blended well with the abstract art the team had seen earlier. Today's design is inspired by the mistakes made in 30days / 30designs. The blouse is made of plain white fabric, but the key detail is that it is made out of 13 different sleeves. These are all sleeves we have used in this project and that we recreated to form a blouse. The silhouette of this piece is interesting and changes depended on the wearer. You could tie the sleeves up or down to create new shapes and movement. Day 25’s blouse is an interesting bold piece, inspired by the heart of this project. 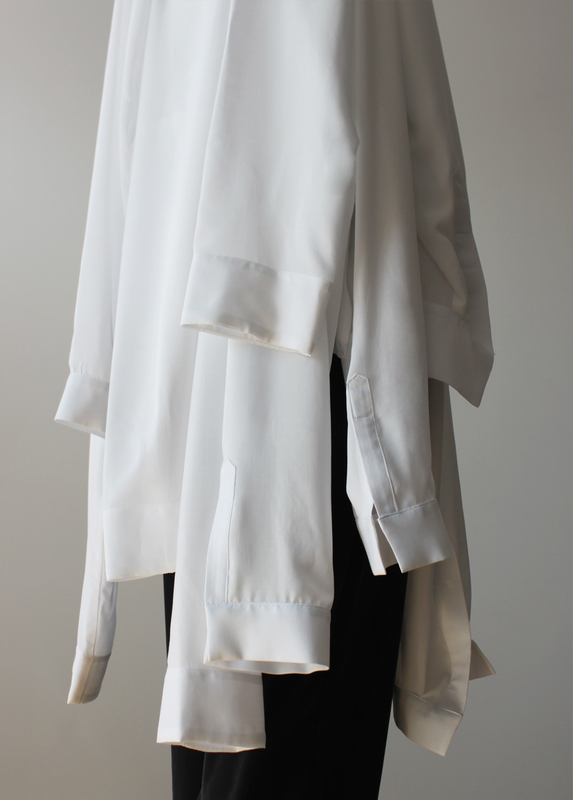 In day 25’s design the sleeves are all different lengths, have different cuffs, plackets and volumes. Today was about taking these pieces and playing with them to create a blouse. This was exceptionally fun. The team got to play with different placements, different styling and got to enjoy creating something with a totally new concept. Almost perfect and Lina’s story made for great inspiration today, it brought the mood of the project up. Everyone enjoyed the day and the design process.